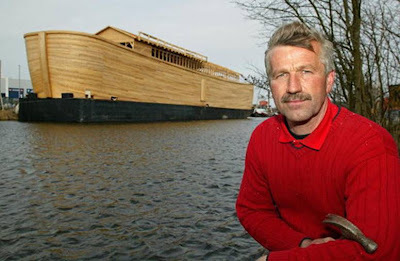 Working Replica of Noah’s Ark Opened In SCHAGEN, Netherlands. The massive central door in the side of Noah’s Ark was opened for the first crowd of curious townsfolk to behold the wonder. 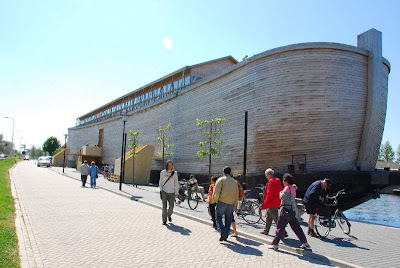 Of course, it’s only a replica of the biblical Ark , built by Dutch Creationist Johan Huibers as a testament to his faith in the literal truth of the Bible. The ark is 150 cubits long, 30 cubits high and 20 cubits wide. That’s two-thirds the length of a football field and as high as a three-story house. 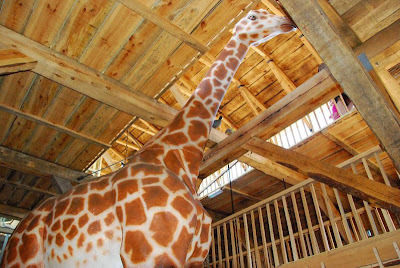 Life-size models of giraffes, elephants, lions, crocodiles, zebras, bison and other animals greet visitors as they arrive in the main hold. 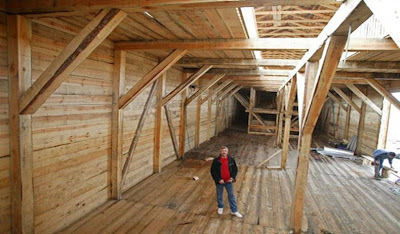 A contractor by trade, Huibers built the ark of cedar and pine. Biblical scholars debate exactly what the wood used by Noah would have been. Huibers did the work mostly with his own hands, using modern tools and with occasional help from his son Roy. Construction began in May 2005. On the uncovered top deck – not quite ready in time for the opening – will come a petting zoo, with baby lambs and chickens, and goats, and one camel. Visitors on the first day were stunned. ‘It’s past comprehension’, said Mary Louise Starosciak, who happened to be bicycling by with her husband while on vacation when they saw the ark looming over the local landscape. ‘I know the story of Noah, but I had no idea the boat would have been so big.’ There is enough space near the keel for a 50-seat film theater where kids can watch a video that tells the story of Noah and his ark. Huibers, a Christian man, said he hopes the project will renew interest in Christianity in the Netherlands, where church going has fallen dramatically in the past 50 years. This entry was posted in apologetics, Bible Study and tagged Bible Study, Christian Apologetics, Noah's Ark. Bookmark the permalink. I would LOVE to write JACK regarding what he has done – as far as building the ARK – I think it is absolutely FABULOUS that he did this – according to the BIBLE!! And that he has a heart for GOD – and wants to spread the “GOOD NEWS” – in the way that he does!!! GOD BLESS YOU JACK!! I might never meet you ‘here’ – but I’m sure to see you ‘when we meet face to face”….I’ll be praying for you daily!! GOD BLESS YOU and YOURS!! !